Monday 21st January 2019 will see the celebration of Martin Luther King Jr Day across the world. Talking to primary pupils about the intricacies of the civil rights movement and racism in the US can be tricky. We’ve added some information about Martin Luther King Jr below, including a timeline, as well as a glossary to help you to discuss the key events of his life. King led the 1955 Montgomery bus boycott and helped organize the nonviolent 1963 protests in Birmingham, Alabama. He also helped organize the 1963 March on Washington, where he delivered his famous “I Have a Dream” speech. On October 14, 1964, King won the Nobel Peace Prize for combating racial inequality through nonviolent resistance. In 1965, he helped to organise the Selma to Montgomery marches. Matin Luther King Jr. was assassinated in 1968. The civil rights movement in the United States was a decades-long movement, with the goal of enforcing constitutional and legal rights for African Americans that other Americans already enjoyed. The Montgomery bus boycott was a political and social protest campaign against the policy of racial segregation on public transport in Montgomery, Alabama. It was a key event in the civil rights movement. The campaign lasted from December 5, 1955 — the Monday after Rosa Parks, an African-American woman, was arrested for refusing to surrender her seat to a white person — to December 20, 1956, when a United States Supreme Court decision declared the laws that segregated buses were unconstitutional. The purpose of the March on Washington was to advocate for the civil and economic rights of African Americans. “I have a dream” is one of the most famous public speeches ever made. In the speech Martin Luther King called for civil and economic rights and an end to racism in the United States. Delivered to over 250,000 civil rights supporters from the steps of the Lincoln Memorial in Washington, D.C., the speech was a defining moment of the civil rights movement. The Selma to Montgomery marches were three protest marches, held in 1965. The marches were organized by nonviolent activists to demonstrate the desire of African-American citizens to exercise their constitutional right to vote, and were part of a broader voting rights movement underway throughout the American South. By highlighting racial injustice, they contributed to passage that year of the Voting Rights Act, a landmark federal achievement of the Civil Rights Movement. Martin Luther King Jr Day was first officially celebrated in the US in 1986. It honours the achievements of Martin Luther King Jr and the civil rights movement. Whilst we don’t get a day off school here in the UK, there are still plenty of ways we can celebrate. Discussing the history of the civil rights movement in the US, and how things have changed for people of colour living here in the UK, gives us a way to acknowledge the mistakes of the past whilst celebrating achievements. MLK Day also gives us the opportunity to discuss racism here in the UK. Do we think racism is getting worse? What can we do to combat racism in schools and the wider community? Martin Luther King Jr. gave many memorable and inspirational speeches during his lifetime. Why not recreate one of his marches and/or speeches in your school assembly? You can download a copy of Martin Luther King’s “I Have a Dream” speech here. You can view a recording of the speech on YouTube here. 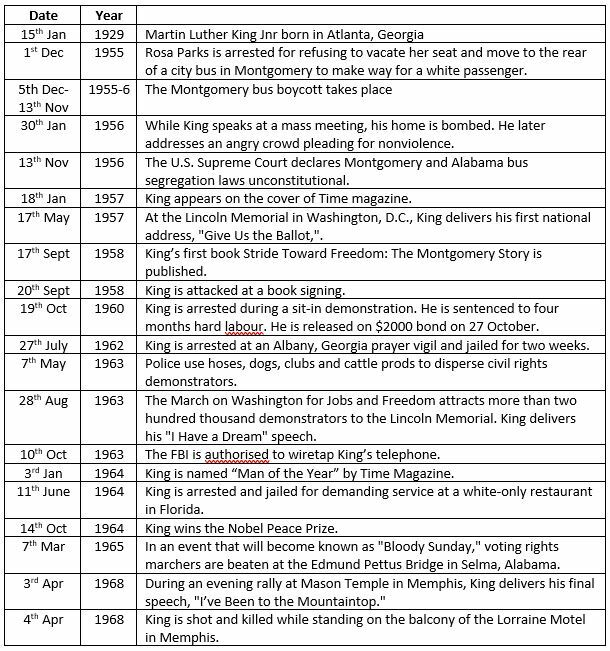 There is a full, more detailed timeline of Martin Luther King’s life, along with further resources, here. With the sparkle of Christmas a fading memory and the dark days and cold weather hanging around for another few months, it can be difficult to stay motivated. We’ve come up with 15 ways for you to embrace this time of year and start the new term off in a positive way.